The Office of the Director of National Intelligence has released a lengthy list of documents seized during the raid on Osama Bin Laden’s compound in Pakistan back in 2011. I’ll leave it to others to parse the contents, but a couple of things stand out to me. Second, the list reveals a kind of actor-reading-his-own-reviews sort of thing going on. Plenty of media stories, think tank studies, and books on Al Qaeda are represented. Somewhere in those reviews there’s a metaphor for the diminished fortunes that led Al Qaeda’s leader to spend his last few years hunkered down in a Pakistani safe house that wasn’t so safe after all. But someone else can puzzle that out. *Unless you read Noam Chomsky for fun, in which case, I’m not sure you ought to be reading me. **OK, maybe Chomsky wasn’t such a bad choice after all. 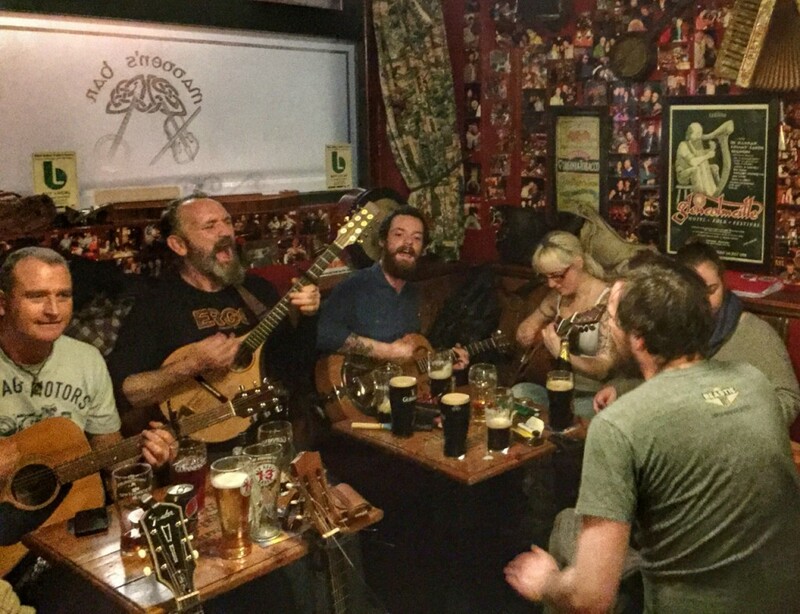 The non-traditional session at Madden’s, with songs sung in full voice. I keep threatening to say a little about the diversions that I find when I come to Northern Ireland. So here’s a bit of an illustrated guide. 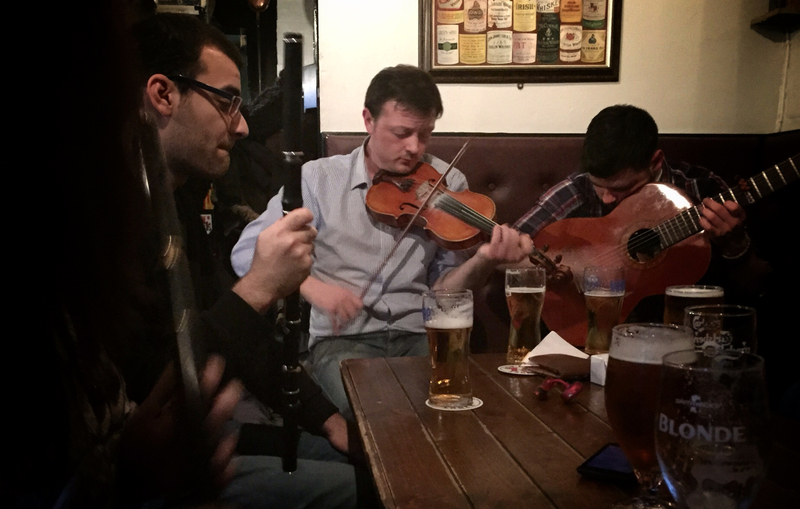 The traditional Irish session Saturday afternoons at Kelly’s Cellars. But not just Saturday. Also Tuesday, Wednesday, and Thursday evenings. And other times when people show up and start playing. A big one form me is music, and Belfast is a great city for it. One of the things I love is that there are pubs I’ve found where you are likely to find people sitting around and playing music almost any time you walk in. My two favorites are in the City Centre, Kelly’s Cellars (which lays claim to the title of oldest pub in Belfast), and around the corner, Madden’s Bar. Both are at the heart of the traditional Irish music scene here but you can hear other things too depending when you stop in. For example, on Monday evenings Madden’s hosts a non-traditional session in which you can hear folk, bluegrass, classic country and string band tunes, singer-songwrighter stuff, and so on. And they let me sit in with my mountain dulcimer and contribute to the music. The sanctuary of St. Columb’s Cathedral, Church of Ireland, in Derry. Another diversion is churches. 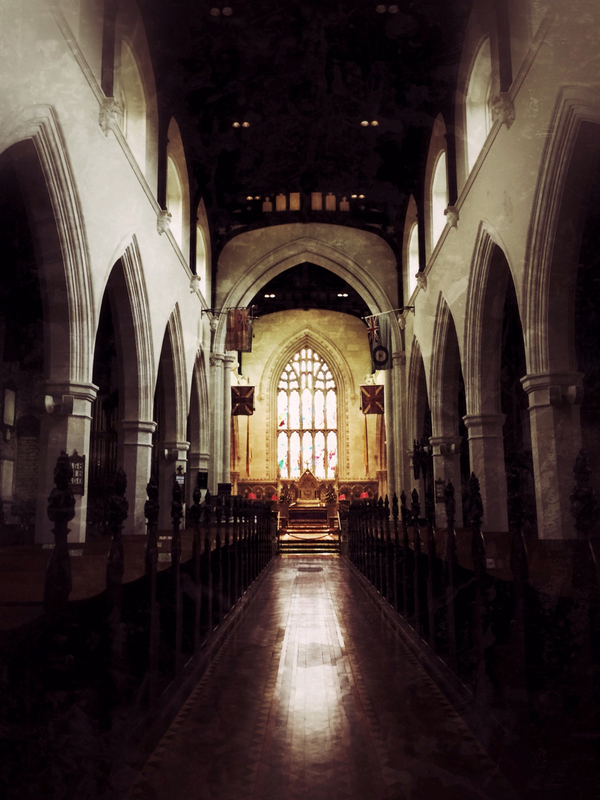 Whenever I travel I try to visit churches, largely because I love church architecture and the history that they often contain within their walls, especially over here. And if I can I like to attend worship services. I have found that doing so gives me time out from the often hectic schedule that I typically have to keep for research. But I’ve also found that going to church, like going to the pub, brings me into contact with people that I would not otherwise meet. This brings me to the last point I want to mention. People. 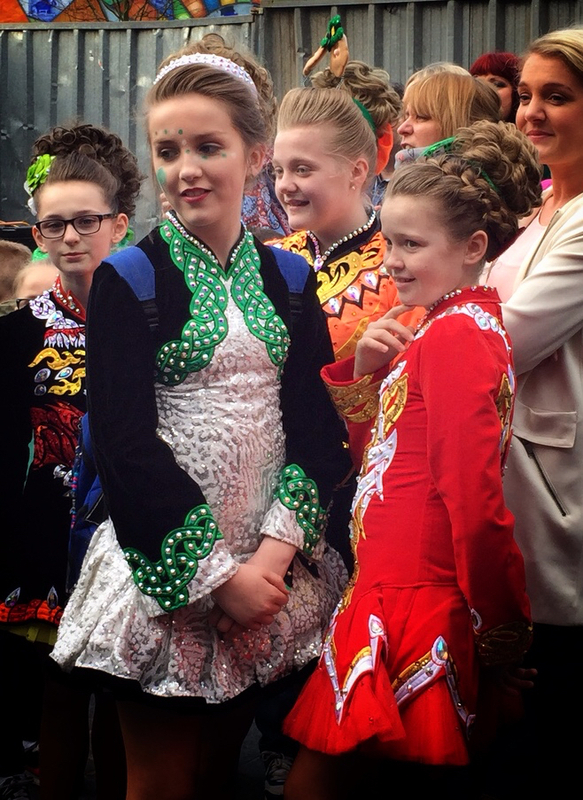 The girls were waiting for their turn to dance at Kelly’s Cellars St. Patrick’s Day festivities. One of the things that I like best about these trips is the people that I get to meet and the windows into other people’s lives that I get a chance to occasionally peer through. Sometimes I walk away with the memory of an anecdote told about hiding petrol bombs under an overcoat on an unusually hot summer day, the reek of the fuel awkwardly filling the air of an electric trolley. Whatever direction the conversation takes I almost always learn from these encounters, and over the years some of the people I’ve met I have come to think of as friends. Standing where kings have trod since 1690, with the castle across the harbor. With my daughter Sarah here for a few days, I’m taking a bit of a break from research responsibilities to play a little tourist and amateur tour guide. So while I still have phone calls to make and interviews to line up for the end of this week and in to next, we are going to get out of town and see a bit of the country. 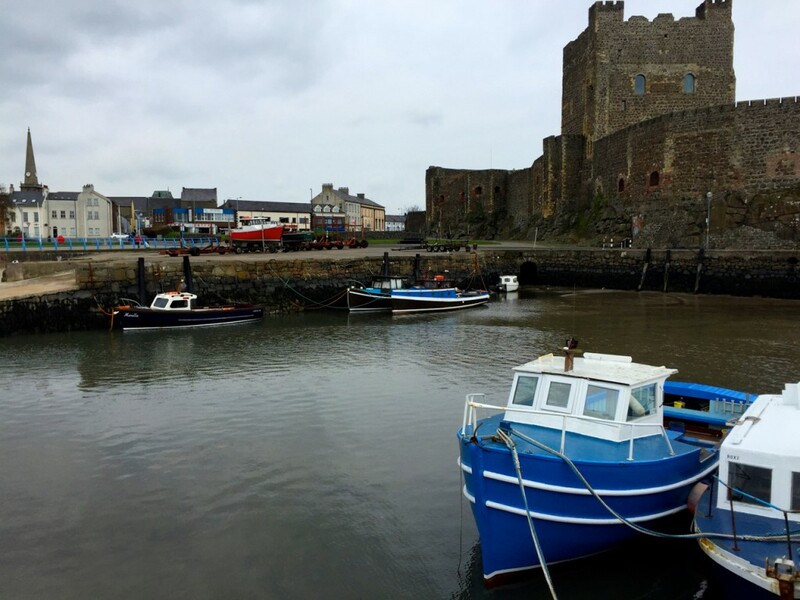 Yesterday we took the train north to Carrickfergus, toured the castle, then stood on the spot where King Billy himself landed in 1690 on his way to everlasting glory and Protestant dominion over these lands at the Battle of the Boyne. * The castle itself is the best preserved Anglo-Norman castle still standing in the North, and the town itself, while more than a little down on its heels, is still pleasant to walk around. Or it would be when it’s not freezing cold, damp, and windy. If you find yourself here, check out the free museum maintained by the Borough Council. It’s worth stopping in. Then walk around the churchyard at St. Nicholas Parish. And the pints at the Great Northern are much cheaper than in Belfast, so take advantage of that too. Tomorrow we are up early to catch the train to Derry, to walk the walls, see the Bogside murals, stand at Free Derry Corner, and perhaps tour the Bloody Sunday museum. Going to mix business with pleasure. 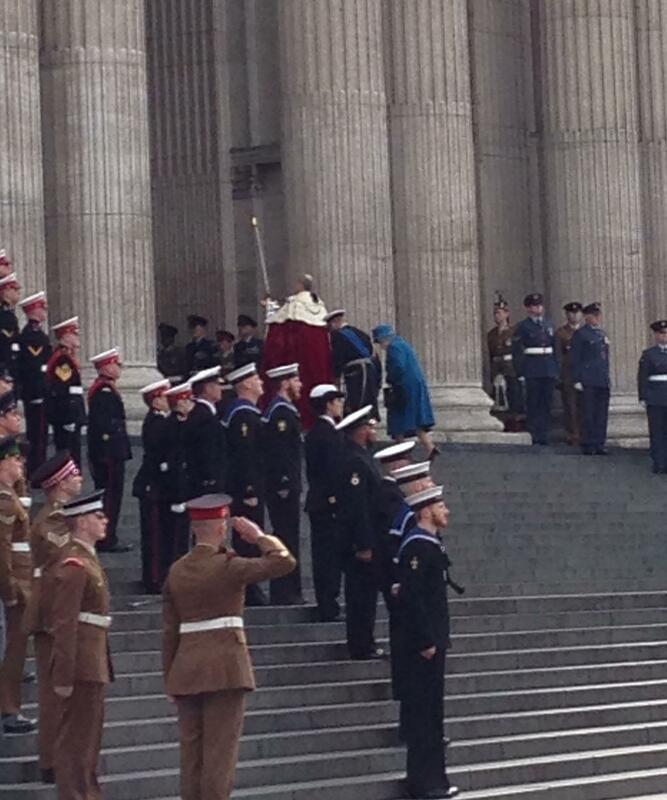 The Queen enters St. Paul’s. I’m watching the BBC’s live broadcast of the national service of commemoration at St. Paul’s Cathedral in London, honoring those who fought and those who died in Britain’s most recent military campaign in Afghanistan. Everything about the service conveys the appropriate tone of solemnity, honor, and respect, from the choices of music, to the scripture readings, to the prayers. It is a stunning spectacle of vestments, dress uniforms, and royalty. The Brits do these things so much better than we do in the States. It’s a pity they’ve had so much practice.